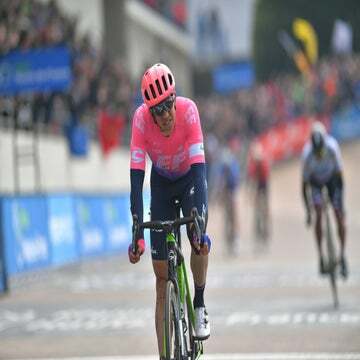 COMPIEGNE, France (VN) — The 2018 edition of Paris-Roubaix will forever be remembered for Peter Sagan’s dramatic attack and long breakaway on the cobblestones. Most journalists or fans watched it on television or streamed it live on the internet. I saw the action from the windows of his car. Last April, I tagged along with longtime cycling photographer James Startt to chase the Roubaix riders across the backroads of Northern France. Not all cycling photographers sit on the backs of motorcycles — many follow along in automobiles. Chasing the pavé is an annual rite of spring for Startt and many of the other cycling photographers, who leapfrog ahead of the race to snap images of the action from the side of the road. It’s an intense and wildly rewarding day in the car chasing the action across cycling’s Hell of the North. 9:30 a.m. Sign-in starts early in Compiègne. Journalists, VIPs and race officials pile into a tent to load up on bad coffee and fresh croissants. There won’t be time to stop until we hit the velodrome nearly seven hours later. Cycling’s who’s who often show up for these big races. Erik Zabel elbows in here, Andrea Tafi stops by for a chat with former teammate Stefano Zanetti at the Astana bus. Riders disgorge from buses and push through crowds of fans to line up. It’s cold and many riders are wearing arm-warmers. Not Stijn Vandenbergh. The big Belgian cobble-basher doesn’t even wear cycling gloves. For Paris-Roubaix, only hard-men need apply. 12:50 p.m. We pile into the car and roll out ahead of the race. Joining Startt is a longtime friend from Paris who’s been tagging along for years and knows the roads well, and will act as co-pilot. The key to chasing Roubaix is dependent on the color of your press credential sticker. If you have one of the cherished green “in-race” stickers, you’re golden. Thirty-two motorbikes and a few press cars troll the Roubaix peloton and can pass ahead of the riders on the paved roads. Our sticker is blue, which loosely translates in French as “journalistically insignificant,” meaning we cannot pass the peloton and we cannot drive in the race. So our only hope is to be nimble, quick and stay ahead of the action uses France’s open roads. 1:25 p.m. We pace ahead toward Troisville, the first major sector at about 100km into the race. It’s a party scene as the anticipation builds for the peloton’s arrival. Some fans are already well lubed on beers and sausages, and there’s a DJ pumping out very bad Euro techno-music. Photojournalists trade gossip and plot their day’s strategy. There’s a bit of bragging rights among the shooters to see who can visit the most sectors during the race. This is one of the most important days of the year for the cycling photographers, and for those who are not lucky enough to be on the motorbikes, chasing the pavé is an annual rite of spring. We stake out a corner to capture the first wave of riders hitting the pavé. Niki Terpstra is first through, looking very strong following his Tour of Flanders victory a week before. About 20 wheels back, Taylor Phinney sweeps through. A soigneur from EF Education First is waiting with wheels that go unused in what’s a good early sign. As soon as the last rider trundles past, everyone races to their cars and latches on to the back of the race caravan. The chase is on! 1:50 p.m. There are a few tricks to chasing Roubaix. First off, always back in the car tail-first so you can re-enter the course without having to back up. A few other basics; have a full tank of gas and keep all your batteries charged up. A top-shelf co-pilot is indispensable. GPS helps, but map reading is an essential skill. We dig into the Michelin maps and follow the green squiggly lines between villages. We dive west to Inchy and then north to Viesly, anonymous French villages that come are the epicenter of the bike-racing world for one day each spring. We arrive just in time to see the leaders barrel off sector 28. A few quick snaps and we’re back in the car to catch them again at Fontaine au Terte, at the exit off sector 26. Startt is happy. We’ve already hit three sectors and he’s been able to shoot some of the biggest names in the peloton. On days like Roubaix, I empathize with my photographer colleagues. If I miss a quote at the finish line, I can get a sport director later on the phone, or ask a favor from a fellow journalist who was there. If a photographer misses the shot on the pavé, well, they miss it and have to wait another year. 2:15 p.m. We make the decision to head straight to the Arenberg forest. The images on the legendary sector are some of the most compelling of the entire racing season, and Startt doesn’t want to risk missing it if we get greedy and try to hit another sector along the way. 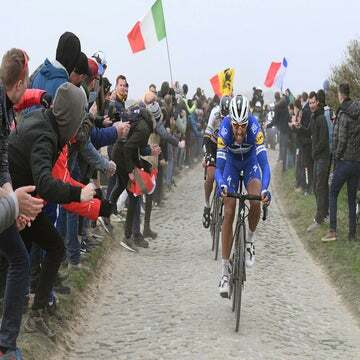 Roubaix has become such an international event that there is more public than ever. That means traffic. With our blue sticker, we are stuck among the mere mortals, and there’s congestion blocking all the major roads. We see random sights. There is a stray Astana rider, his torn jersey covered in mud, and he’s left to try to pick his way along back roads to a spot where a team car might be able to pick him up. A lone EF Education First rider raises his arm in defeat as he punctures near the rear of the peloton, realizing his race is over. 2:55 p.m. More traffic, more stress. We double-back across some secondary roads and find another traffic jam on the main péage. Startt is getting nervous as we follow the action over the race radio. Warm weather and a fast pace mean the peloton is barreling along at record speed. We later roll up to the highway exit that they’ve used every spring only to find it’s closed to traffic. Security concerns are higher than ever in France following a string of terrorist attacks, and police are out in force. We double-back at the next exit, only to find another big long line of traffic of fans trying to get into the Arenberg. We’re getting Franced. Startt gets out and sprints toward the pavé while we find a spot to ditch the car. We arrive just in time to see Peter Sagan among the front riders storming off the Arenberg. Something special is happening and there’s a buzz in the air. 3:25 p.m. We backtrack out of the Trouée d’Arenberg and race northward. The cobblestone sectors are numbered backwards during Roubaix, starting at No. 29 at Troisville to No. 1 within sight of the finish line at the Roubaix velodrome. We are just hearing reports about Michael Goolaert, and hope for the best, and only later do we hear confirmation of the tragic news. We’re intent to stay ahead of the race, but we can see the TV helicopters flying above the leading riders, so we know it’s going to be close. We target Orchies, and arrive at Sector 12 at Bersée just in time to post up. Fans are everywhere. Some along the road raise their arms in cheers as the riders barrel past. Others wave flags and banners. Everyone is in a good mood. The race is breaking up and riders are in small groups everywhere. I lean in among a group of fans to check a TV they have set up, only to be scolded that my presence might ruin their precious reception. 4:10 p.m. This is where we strike gold. Chasing Roubaix is a bit like an Easter egg hunt and a car rally. After digging into the Michelin maps, we plot a course on the fly. Startt’s driving and we’re directing him: left here, straight 300m, then left again. The prize? We arrive just in time to witness Sagan’s winning surges. After Bersée we bomb north toward Mons-en-Pévèle and post up just in time to see Sagan come ripping past again. It’s an amazing scene, with the rainbow jersey lighting up the race. Fans cheer in delight and we’re all pumped because we’ve just witnessed what looked to be the race-breaking moves. Startt is overjoyed because the photos could mean pay dirt. 4:30 p.m. We manage to get across to Sector nine and park the car on the north side of the road, soon enough to see Sagan widening his lead. We watch a few more riders dribble past, and now realize, barring disaster, Sagan will probably win. We make the call to skip the decisive Carrefour de l’Arbre and B-line straight for the finish line. Startt, who’s covered dozens of editions, knows the back roads into Roubaix, and the road is jammed with soigneurs and team cars racing toward the velodrome. Disaster strikes: traffic is blocked at a train crossing about 10km south of Roubaix. Startt’s heart sinks because there’s no movement and we’re sitting there powerless as we hear the calls over race radio that Sagan exits the final decisive sectors with only one rider on his wheel. After what seems like an eternity, the train chugs finally through, and there’s open road all the way to Roubaix. We ditch the car and sprint toward the velodrome. Sagan and Silvan Dillier are already in the stadium, but we reach the finish line just in time to see Sagan raise his arms in victory. That makes seven total viewings between Compiegne and Roubaix. We had to work for each glimpse of the race, and each one produced memories and photographs. Our final stop is perhaps the best. Startt nails the winning shots, and I revel in my wild ride from start to finish. What a day.